We ordered 1,000 YouTube Views from AudienceGain to test their service, and everything went pretty well. Our Views arrived on time, but the average watch time was a bit low at 40%. Customer support answered our questions fairly well, which shows that you can get in touch with them if necessary. AudienceGain also has a good refund policy in case there's an issue with your order. Overall we recommend their service if you want to boost your view count fast, and would advise you to visit them now by clicking the button to visit their website. AudienceGain has been providing social media boosting services since at least 2015, and they're based in the U.S. They offer competitive pricing and good-quality services. You'll find some grammar issues and odd language on the site, but they will provide the services they offer. 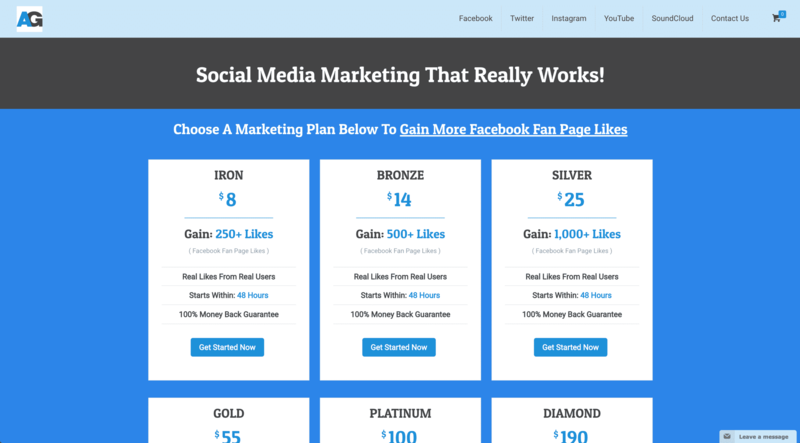 They provide services for YouTube, Facebook, Twitter, Instagram, and SoundCloud. For YouTube, you'll be able to buy Views and Subscribers. Plans range from 1,000 Views to 100,000 Views. We reviewed the terms and conditions sections on the AudienceGain website and made a few comments on their status below. To find out more details on these, then please toggle the sections to see what we thought! AudienceGain has a basic Terms of Service on their site. AudienceGain does not have a Retention Policy in case Views are removed, but YouTube doesn't usually remove Views. 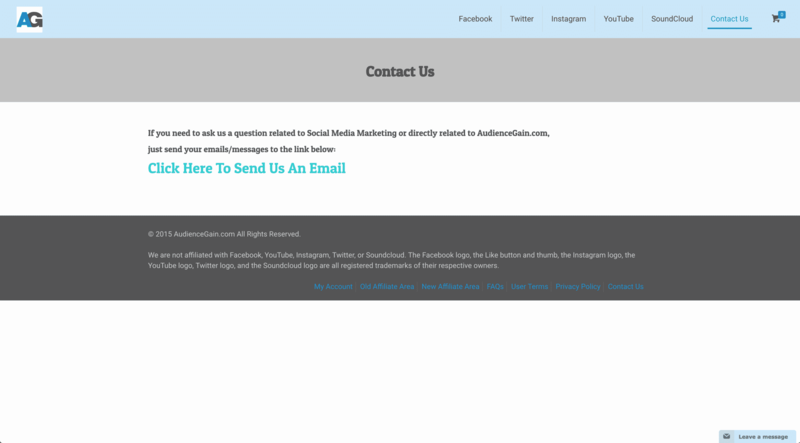 Before we ordered, we sent AudienceGain some questions to test their customer support out. They replied in less than a day, with some decent answers that were somewhat vague. There was no answer to our question about how long the viewers would watch our video. "It depends on the amount of the order....up to 5 days for orders less than 500k"
"Depending on the size of the order they will come within the time frame." "Worldwide people interested in the vido." "No they won't make comments." "We will refill them, but this never happens." "We can give your money back if you don't like the service." After ordering, we like to send another set of question to see if they treat a paying customer any differently. As you can see, they answered each of our questions, but some of the answers were a bit vague. "The views won't be removed." "It depends on the amount of the order. But yes we can offer discounts." "It's possible they would view the other videos, but we can't promise. They won't make comments." "The account won't be banned or anything." We recommend the Views service of AudienceGain if you want to increase your View count. The average watch time wasn't very high, however, so if you want better quality views you'll need to look elsewhere. The Views we ordered came very fast, arriving the very same day we ordered them. The Views we got from AudienceGain came very quickly, but unfortunately they had a pretty low average watch time at just 40%. The Views we got from AudienceGain have stuck around, just as expected. 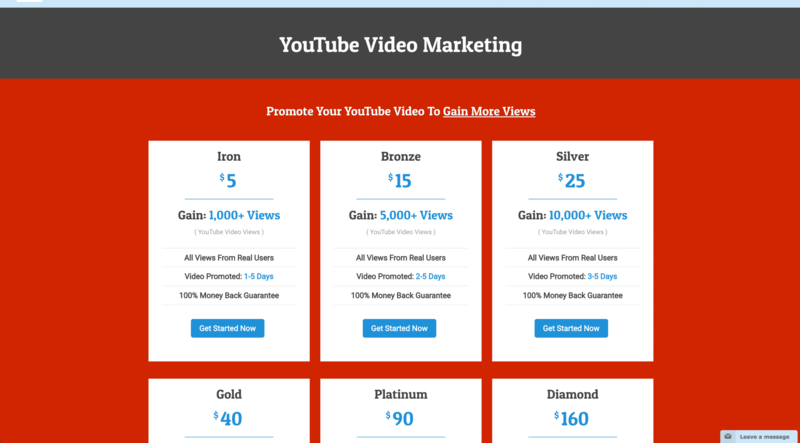 We ordered 1,000 YouTube Views from AudienceGain to see how well they could deliver their service. Overall the order went pretty much as expected - the Views arrived on time the very same day, though the average watch time was pretty low. AudienceGain has a good money-back guarantee policy in case anything goes wrong with your order, so you can buy with confidence. 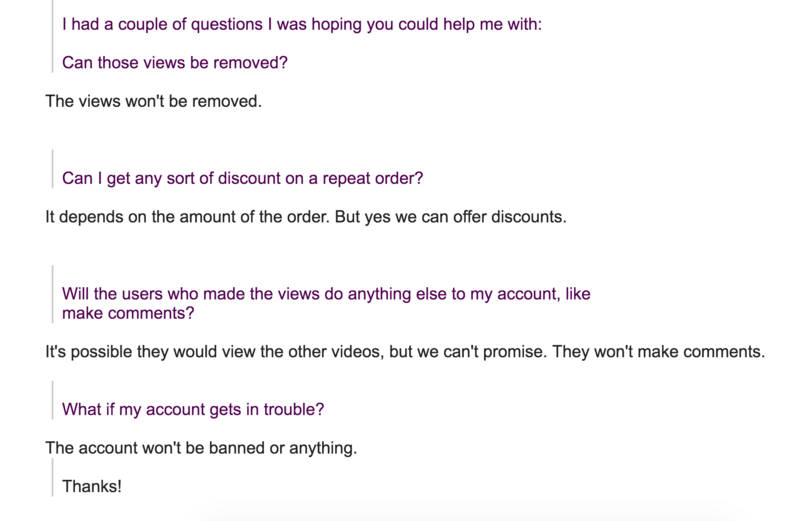 Their customer support team was responsive to our questions, though they didn't end up answering all of our questions. We can recommend their services if you want to quickly grow your view count, it is safe to click the button below to visit their site and make the right purchase for your channel. The views we ordered came in at the agreed time. The average view time was exactly what we had hoped for. Overall we are very impressed with the quality of service. Their money back guarantee in case anything happens to my order was what i needed to confidently make a purchase esp since it was my first time. I got exactly what i had wished for with the retention rate even surpassing my expectations. Its a great service. The views i ordered arrived in the exact time i wanted. The retention rate was also great with the overall viewing time being way more than average. When getting a service to boost my youtube views i am more keen on retention. I made this clear to the customer support before i made my purchase and i am happy audience gain delivered exactly what i requested. I got my views and they have a pretty high retention rate. I bought your views and I am glad I did that because my video raked in more views than I have ever done using other services. Your customer support is brilliant as well. They were very informative making it easy for me to make my order. I got my views same day I ordered over 1000 of them. The customer support was great helping me make the decision to use their service. The retention rate was beyond my expectations. Will use them again. My order for 2000 views came on the same day with 200 free views on top. The average watch time was also significantly higher than other services within the same price range.I highly recommend them for the great work. Having had prior nasty experiences with similar service providers, a money back guarrantee is a big deal for me and the customer support at AudienceGain assured me of their money-back guarantee policy in case anything goes wrong with my order, with this i made my order and everything went as i had expected. I got my views right in time for my video launch and the views I got sparked more views. I highly recommend it especially to those working on a budget like I was.